When people talk about Basecamp, they tend to either love it or hate it. I am not going to go into holywars here, but let’s just say that if you fall into unhappy category or want some of the same but free - there is no shortage of Basecamp competitors and there are a lot of solutions to choose from. The two most popular FREE Basecamp alternatives are Bitrix24 and Asana. Let’s look at Bitrix24 here, because in my opinion it’s the best alternative on the market, far superior to Asana on several grounds. Price – the fully featured Bitrix24 is free for 12 users. If you want to have unlimited users – that’s $99 a month. Platform – cloud and self-hosted versions are available. The self-hosted version (i.e. the one that you host on your own server) comes with API and source code, so you can modify it as you please and integrate with other tools. Migration from Basecamp – easy, special free migration app is available through Bitrix24 marketplace (must log into your Bitrix24 account to access it). PM features – more or less identical to Basecamp. Tasks, subtasks (nested tasks), recurring tasks, project management, Gantt charts, mobile app,Employee Workload Planning (allocating time for specific tasks and seeing if time allowed is exceeded or not to control your labor costs), time tracking,time management, check lists, reports, workgroups, working with external users (extranet). Workflow management (business processes) and records management – yes. DocManagement – yes. 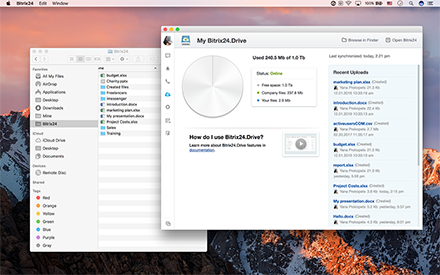 Private and shared documents, document sharing outside your network, versioning for documents (version history), online document editing without MS Office, collaboration, network drive mapping, Bitrix24.Drive (essentially free Dropbox alternative for your company). Integrations with Google Docs, MS Office, Office 365, LibreOffice, OpenOffice, etc. 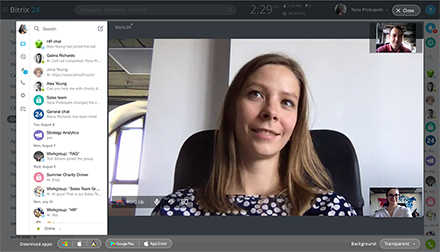 Communications – intranet (activity stream), enterprise social networking,instant messaging, group chat, mobile enterprise messaging, videochat, videoconferencing, web phone. 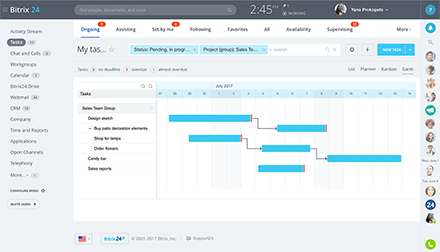 CRM – yes, fully featured, integrated with project management and doc management. Other features worth mentioning – HR tools, built-in HelpDesk, eLearning module, email connectors. - You want access to source code. Like I said there are quite a few tools that can replace Basecamp, so stay tuned for reviews of other Basecamp alternatives.